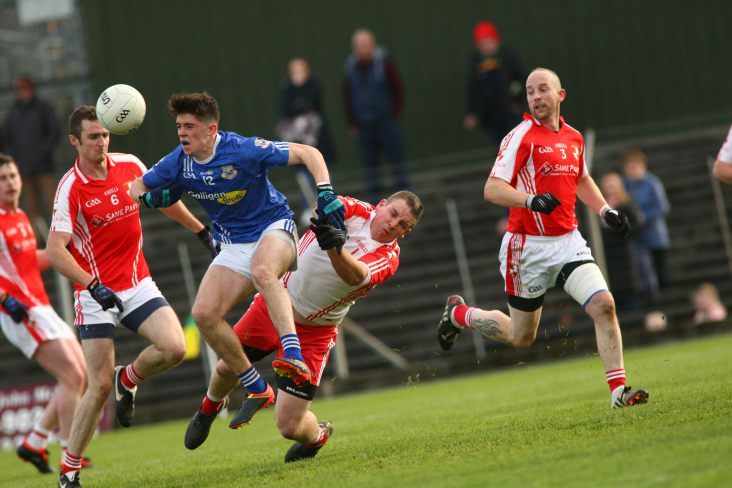 Two second-half goals were decisive as Ballinlough saw off Oldcastle in the Corn na Boinne final at Pairc Tailteann on Sunday. Ballinlough looked to be putting a deposit on the silverware having moved 0-10 to 0-6 clear after 50 minutes. Two goals in the latter stages settled matters and saw Ballinlough gain some consolation for their IFC final loss to Longwood. Peader Byrne's late point decided the IFC semi-final between the sides. This time his seven-point tally had a major bearing on the outcome. Simon Deevy proved a useful target man at full-forward for Brian Donohoe's men and his efforts were central to both of his sides goals. Ronan McGuinness bagged the opening one that left it 1-10 to 0-6. Ronan Maguire pulled a point back for Oldcastle before the team in red and white bolted the gateway to silverware on their neighbours. This time Thomas McCullen netted to leave nine points between the sides. Oldcastle continued to battle and Stephen Tierney's goal softened the look of the final scoreline. The second-half was a step up on the first while both sides had other goal chances. Ballinlough 'keeper Dereck Muldoon denied Oldcastle's CJ Healy in the 33rd minute. Before the end of the third quarter Oldcastle goalkeeper Conor McHugh did well to deny Mark McCullen. Earlier in the half McHugh pointed a 45 to cut the gap to the minimum. In stoppage time at the end of the hour, Ballinlough goalkeeper Dereck Muldoon was red-carded after a break outbreak of unpleasantries between a few players from both sides. Ballinlough were never headed but the scores were level three times in the opening 37 minutes. Proceedings opened in a low key with just two scores in the opening 12 minutes with six wides being registered in the opening quarter. Persistence was rewarded in the third minute when Peader Byrne landed the opening score from a close-range free having missed the target with two earlier attempts (one free). Ronan Maguire's seventh minute point levelled matters with Jason Scully providing the assist from a cross that was well-fielded by the scorer. Points from Ronan McGuinness and Byrne moved Ballinlough 0-3 to 0-1 clear by the end of a low-key opening quarter. Two Scully scores (one free) levelled matters, 0-3-all, by the 22nd minute. The second of that brace was a fine solo effort, one of the few highlights of the first 30 minutes. Byrne closed the first-half scoring with a brace of points while team captain Michael Geraghty came close to goaling with a low shot into the old swimming pool end. Ballinlough led by 0-5 to 0-3 at the break having shaded a less than enthralling first-half that yielded 10 wides to eight scores with Oldcastle marginally more wasteful. Ballinlough - Dereck Muldoon; Robert Farrell, Padraig Muldoon, Matthew Farrell; Emmet Smith, Michael Geraghty (C), Johnny Reilly; Lorcan Maguire, Thomas McCullen (1-1); Sean Geraghty, Ronan McGuinness (1-2), Mark McCullen; Benji Smith, Simon Deevy (0-1), Peader Byrne (0-7, 3fs). Subs - James Baugh for M Farrell (52),Niall Farrelly for McCullen (57), Conor Briody for Smith (60 + 2). Oldcastle - Conor McHugh (0-1 45); Oran O'Reilly, Cian McPartland, Thomas Flood; Patrick Rahill, Gerard Reidy (0-1), Keith Connell; Ross Cadden, Eoin Gilsenan; Patrick Kevin, Stephen Tierney (1-0), Jason Scully (0-3, 2fs); CJ Healy, Ronan Maguire (0-2), Robert Farrelly. Subs - Darren Hawdon for Rahill (ht), Peter Monaghan for Kevin (ht), Paddy Gilsenan (0-1) for Reidy (bc 42), Sean Maxwell for Flood (43), Lee Healy for Robert Farrelly (50), Kyle Kavanagh for Healy (57). Referee - Cormac Reilly (St Mary's).